There are few physical locations as dear to my heart as the greater Moab area of South Eastern Utah. It is for this reason, upon arrival in Arches National Park, I exited my car, got on my hands and knees, and kissed the red rock that transfixes my gaze, transforms my heart, transubstantiate my soul into living breathing earth. For me, kissing the red rock is akin to a Catholic kissing the Papal ring, a symbolic gesture of respect to the office and submission to authority. 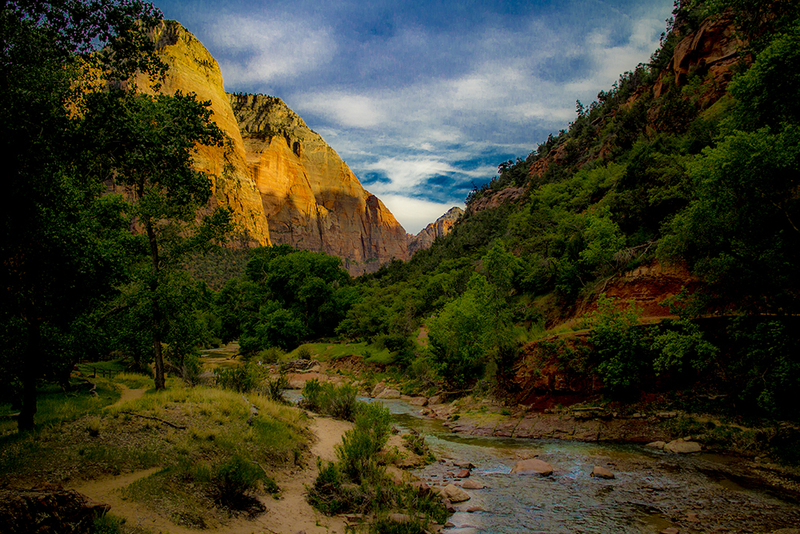 For me the office is this amazing land of red rock and the authority figure is Mother Earth. 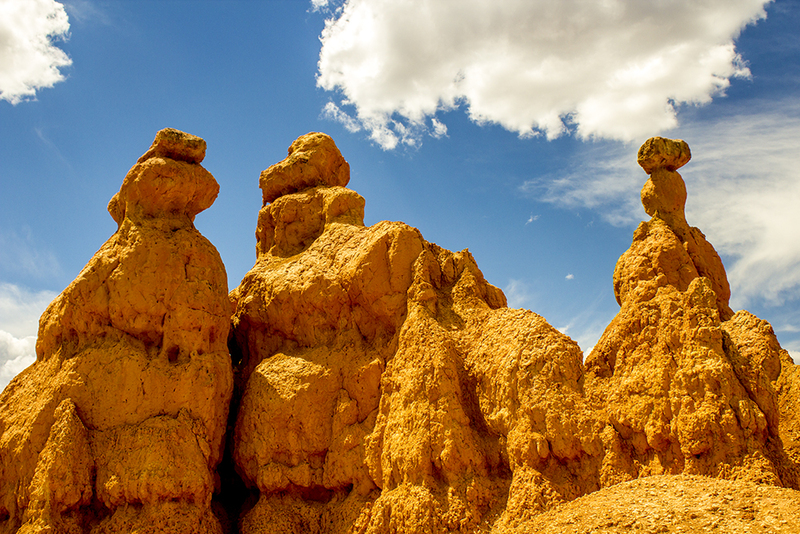 My wife of two days and I had just driven most of the day from Zion National Park where the cacti were in bloom, took a side excursion to the pink rock canyons of Bryce NP, before arriving at Arches NP where we made a beeline to the Delicate Arch trailhead. I had seen this most eloquent of arches at sunrise, during the heat and blue light of the midday sun, but never as the setting sun kissed the rock goodnight, never on a day she bathed in the glory of a full moon. My quest since I opened my eyes very early in the morning was to make sure we arrived to witness both celestial events. The hike is not terribly long, a simple 1.5 miles…but…it’s almost entirely an uphill jaunt (480 foot elevation gain) with a longish section on solid rock with a steep, thigh taxing incline, a definite challenge for those of us used to the flatlands of Chicago and the Midwest. Did I say simple? I have seen her at least four times previously. Still, every time I make the final approach along the tall wall of red sandstone opening to the vista with a deep dish in the foreground, Delicate Arch in the mid-ground, and snow capped mountains in the background, I am awestruck. I feel engulfed by the sacred. My eyes have feasted on the sublime works of the great artists. I have sensed the divine in intricate Indian temples raised to honor gods. I have marveled at the creations of brilliant engineers reaching 100 stories and more into the heavens . None of these compare in grandeur to the natural creations of the Almighty. None of these strikes the primeval part of my soul breathed into existence by our great Mother and great Father as does this vista. 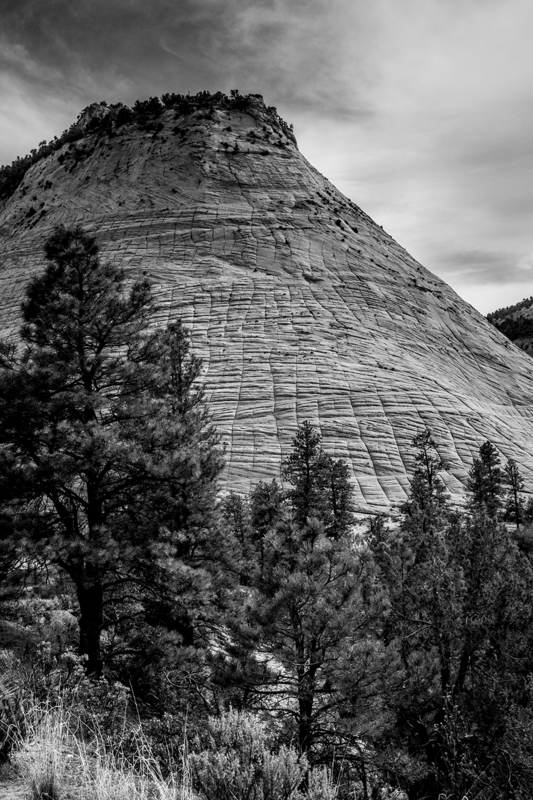 Few creations connect with me as viscerally as does Delicate Arch and the surrounding country. As much as I wished this moment could have been shared only between me, my wife, the arch, and the vast expanse, such was not the case. My dream was to make love beneath the arch as I looked lovingly into her deep brown eyes while the moon gently looked upon our naked bodies and the gentle winds caressed us. Primal act in a primeval world. Such was not to be…not to be this time. 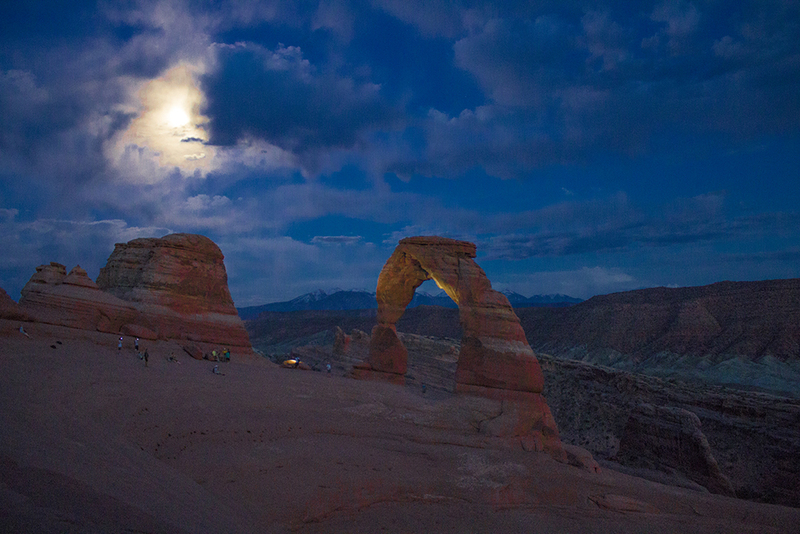 At least 100 people were already there scattered around the deep dish gazing at Delicate Arch. Some gazed adoringly. Some gazed in awe. I gazed with reverential respect. Many were still there when we took our leave after sunset and moon rise. One should not approach Delicate Arch in a rush. It’s important, initially, to keep a respectful distance and pay homage then deliberately make way into her presence, slowly expose oneself to her glory from as many angles as possible before finally standing in the great opening between her massive legs and feel birthed anew. This is how I approached. I took my time stopping frequently struck by amazement. I cast my eyes upon her, upon the multitude giddy with delight, upon my lovely wife who was having her first experience with this magnificent earthly being. We sat silently and watched the sun paint her in varying shades of red as it sunk beneath the far Western horizon. We watched a man drop to one knee and propose to his girlfriend beneath the arch. (She said yes.) We watched the ascending moon peak from behind scattered clouds and bathe her in a tickle of blue light. I would like to have stayed there the entire night, stay until the moon arced across the entire sky and the sun returned the following morning. But, we were tired and we had no camping gear and we still had to check in to our hotel before the front desk closed for the evening. And this and that….excuses all. When leaving the enclave of a deity at a Hindu temple, it is considered respectful to walk away backward, preferably on one’s knees in a backward crawl while keeping the deity in sight. I felt this lent an appropriate amount of respect for leaving the presence of the ancient Delicate Arch. Crawling backward blind is not the best move in the canyon country. I walked and scrambled over boulders until I returned to the red wall. Then I turned back toward the arch, made a slight bow, and took a few backward steps until it passed from my sight line. We turned on our flashlights and began the trek back to the car. 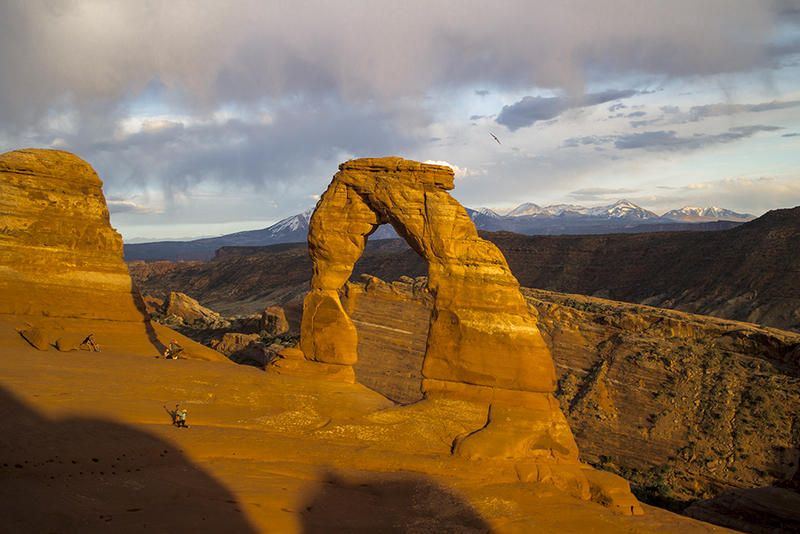 I caught myself thinking about my next visit to Delicate Arch….and there will be a next time. I plan to go during a new moon and see her against the backdrop of a blanket of stars scattered across the heavens. The upper walk area, before the steep solid rock descent, is partly on sand, partly through a field of boulders, partly through bushy trees. We used our flashlights to find the cairns that would show us the path out. The beams of our flashlights caught numerous kangaroo rats foraging for seeds and nuts. I was hoping to see a rattlesnake or a coyote or an owl hunting the rodents but luck was not with us on this evening. Once we reached the steep descent we pocketed our flashlights and walked the remaining trail by the light of the moon which had, by now, escaped from behind the clouds and was hanging high in the sky. We walked hand in hand, mostly in silence, savoring the experience of the amazing day. 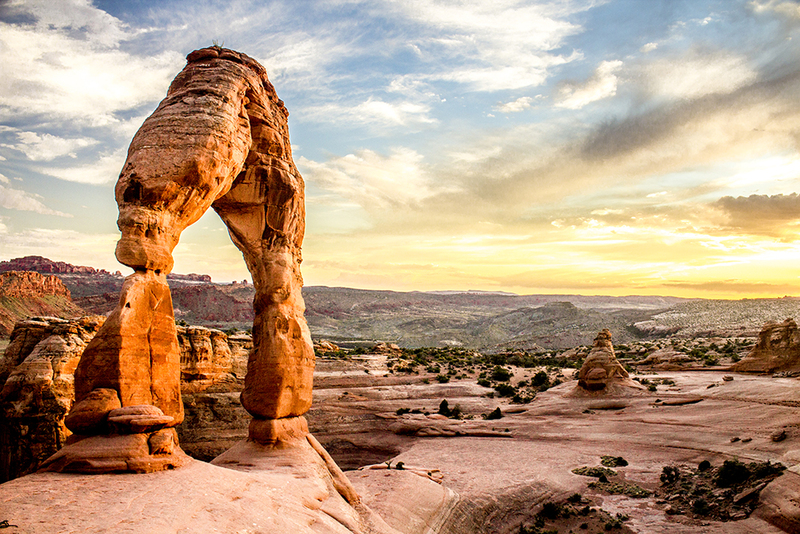 This entry was posted in Travel and tagged Arches, Arches National Park, Delicate Arch, Moab, National Park, Red Rock. Bookmark the permalink. be really one thing which I believe I’d by no means understand.